Russia has hit out at an ‘unprecedented’ NATO military build-up along its eastern border. A military spokesman says this clearly violates a Russia-NATO treaty, which forbids the alliance from permanently stationing troops in the Baltic States. The Russian Foreign Ministry has declared NATO’s encroachment as an unprecedented violation of the Russia-NATO founding act, which was signed in May 1997. The act forbids the trans-Atlantic organization to station troops in Estonia, Latvia and Lithuania permanently. "NATO buildup on the eastern flank, or in the so-called 'front-line countries,' is an unprecedentedly dangerous step that violates all agreements, including the Russia-NATO Founding Act, which is still in force," the ministry's spokesman, Alexander Lukashevich, said at a news conference. NATO has stated their mission is a temporary one. However, it is not clear, when and if ever, the alliance will withdraw their troops. 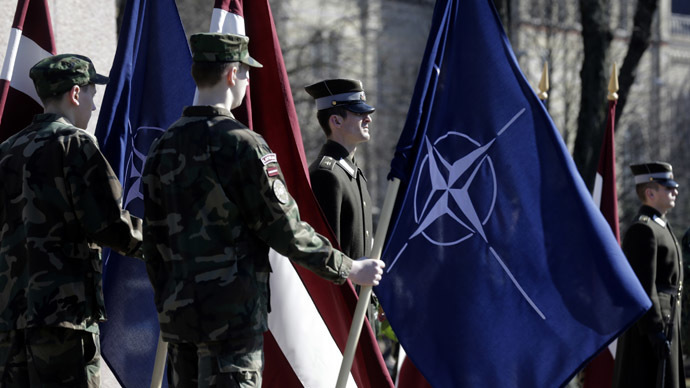 Since April 2014, NATO has conducted a series of drills called Operation Atlantic Resolve. On Wednesday, the head of NATO Jens Stoltenberg said the alliance was undergoing its largest troop increase since the end of the Cold War. In February, the organization said it would double its Eastern European Response Force to include 30,000 military personnel. Romania is currently considering whether to host NATO’s heavy military equipment, but NATO Supreme Commander General Philip Breedlove has hinted that Bucharest will offer its support to the alliance. “This decision will be announced very soon – how this all will be accomplished – and my expectation is that if Romania is asked to participate, they will do so as they have done in every NATO venture so far, and have been a great host and great allies,” General Breedlove said. However, Lukashevich had strong words for Romania over possible NATO deployment in the country. While in Bucharest, Breedlove also discussed plans for Romania to house a missile defense system in the town of Deveselu. "If the Romanian government considers it acceptable to increase the presence of NATO forces on its land, and create such a powerful 'armed fist,' they just have to be aware of the responsibility and the consequences of such a move," Lukashevich said, according to Sputnik. Russia sees the troop build-up and numerous drills by the trans-Atlantic organization as additional proof that NATO is an anti-Russian military bloc, which has taken advantage of the Ukrainian conflict, using it as a pretext for a military build-up in Eastern Europe. “NATO is developing its rapid response forces and is boosting its infrastructure near our borders, we are registering attempts to violate nuclear parity and the creation of the European and Asia-Pacific segments of the missile defense systems is being sped up,” Russian President Vladimir Putin said in an address to the FSB collegium on March 26.